sfgirlbybay: Thanks and Have Fun Running The Country. Thanks and Have Fun Running The Country. Happy Inauguration Day, everyone! I received word from the McSweeney's newsletter that a few days after the election of Barack Obama, that Dave Eggers' 826 Valencia students from around the country were asked to provide advice and guidance to their new president. 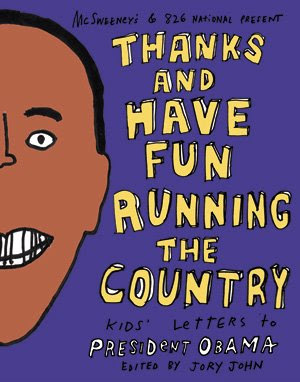 In this collection, Thanks and Have Fun Running The Country, you'll find a ton of young wisdom for the new president, often hilarious, sometimes heartfelt, and occasionally downright practical. Topics include the economy, education, war, global warming, snow cones, microwavable burritos, and the ghost of Abraham Lincoln. You can order Thanks and Have Fun Running The Country here. "If I were president, I would help all nations, even Hawaii." - Chad Timsing, age 9, Los Angeles. "I really hope you put America back together. No pressure, though." - Sheenie Shannon Yip, age 13, Seattle. "1. Fly to the White House in a helicopter. 2. Walk in. 3. Wipe feet. 4. Walk to the Oval Office. 5. Sit down in a chair. 6. Put hand sanitizer on hands. 7. Enjoy moment. 8. Get up. 9. Get in car. 10. Go to the dog pound." - Chandler Browne, age 12, Chicago. And, while it wasn't advice, exactly, they thought this was worth sharing: "You are just like a big me." - Avante Price, age 7, Seattle. How cute. I think I will have my kids write something today and then look back years from now on what they were thinking and feeling. ha! i just received mcsweeney's email as well and my book is on order. insanely sweet sentiments. why must we grow up?! loving the gorgeous interiors below. no doubt the obama abode will be gorgeous. wow. thanks for sharing. Awww! Bless those little innocent folk! Very sweet! Thanks for the post! Hilarious and some of them are actually pretty relevant ha ha. Just ordered two - one for myself and a friend who will adore this! Outta the mouth of babes...pretty good advice. You gotta love it. I love every little bit of this. 826 kids rule.